Made primarily of cooked dry white beans, half of which are pureed, it's only other ingredients are sage leaves sauteed in olive oil, a little crushed garlic, water, the tiniest amount of strained tomatoes, salt and pepper, and typically no meat. Cooked with maltagliati pasta - a cut of pasta that is made up of scrap leftover pasta, and literally translates as "badly cut," that really speaks to the history of Pasta e Fagioli as a peasant dish, created from readily available and inexpensive ingredients. A pretty far cry from the original, most people only know Pasta e Fagioli from the soup served at the Olive Garden restaurant, or the internet copycat recipe, both of which differ substantially from the Italian pasta and white bean dish. I wrote this recipe melding some ideas from both. While Olive Garden copycat versions seem to use a lot of meat, some as much as 2 pounds in fact, since the authentic Italian version typically uses none, I reduced that substantially to just 1/2 pound of ground chuck, drained of excess fat after browning. Substitute half beef and raw pork, or Italian sausage if you prefer, or for a meatless meal, eliminate the ground beef and use a vegetable broth. Most of the Americanized versions of Pasta e Fagioli soup are also very heavy on celery, some as much as four ribs. I like celery, but the authentic version has none, so I reduced that to a single rib. Copycats also use jarred or canned commercial pasta sauce, which I replaced with canned San Marzano tomatoes instead and added a little bit of brown sugar to sweeten them a bit. For an extra bump of veggies, I added in a can of V-8 vegetable juice - use spicy if you can tolerate the heat. When using fresh tomatoes or canned whole tomatoes in a recipe, I almost always counter the acidity with a little granulated or brown sugar. Substitute fresh tomatoes when at peak and in season; you'll need about 3 extra large tomatoes. If you substitute jarred or canned pasta or spaghetti sauce for the tomatoes, it already contains both salt and sugar, so be sure to taste first for seasonings, before enhancing further. The Cento brand of San Marzano tomatoes does not contain sugar, so I sometimes add a little, depending on how the tomatoes taste. Some kind of greens such as spinach, collards, turnip or mustard greens are a great addition for this soup, whether fresh, canned or frozen. Drain if using canned, thaw and squeeze out excess moisture with frozen, and chop into bite-sized pieces before adding to the soup. Since my husband and I don’t ever consume a full pot of soup at one sitting, I have always preferred to cook the pasta separately and add it to individual bowls in 1/2 cup servings, spooning the soup on top. If you are going to eat all of the soup in one sitting, you can wait to add the uncooked pasta near the end of the cooking time, rather than boiling it ahead. Allow it to cook for about 10 to 15 minutes, or until it is cooked through and tender. Serve soup immediately with a nice mixed garden salad and crusty garlic bread. By the way, ever wonder why I often drain and and rinse beans in my cooking? So, that's why. Drain and rinse them and then you can control any additional seasonings you put in to affect the saltiness in your dish. Besides. That goop kinda freaks me out anyway. 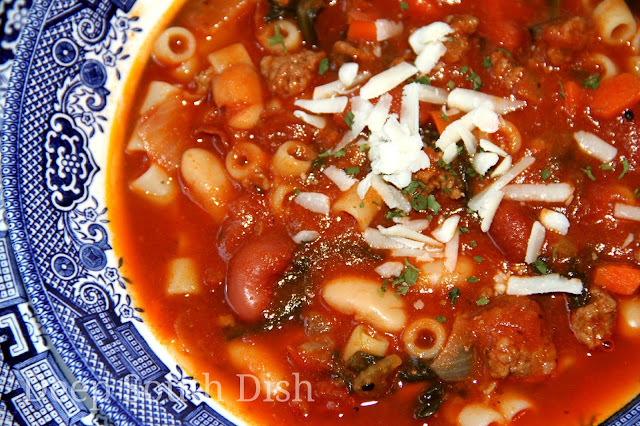 So, let's make some Pasta e Fagioli soup! I like to prepare my pasta separately. Cook pasta in boiling salted water according to package directions; rinse to wash off excess starch and let drain well. Set aside, stirring occasionally to release excess moisture and prevent sticking. We're using ditalini pasta here. Chop up the veggies for your mirepoix - chopped onion, carrots and celery. It's not traditional in the Italian version, but it is in our Americanized version. Heat a tablespoon of olive oil over medium heat, in a large soup pot, and sauté the onion, carrots and celery about 10 minutes, or until very tender, stirring regularly so that they do not brown. Add the garlic, Cajun seasoning, Italian seasoning, basil and sage; stir in and cook another minute. Add the ground beef and cook until no longer pink, stirring regularly. Drain off any excess fat. San Marzano are one of my favorite canned tomatoes to use for sauces and soups, and even homemade salsa. I just use my kitchen shears to chop them up right in the can, or you can simply crush them with your hands into the soup pot. I often like to use whole tomatoes, rather than already diced tomatoes, because they are more flavorful and the closest thing to the real deal. Cento is a great brand. Add the tomatoes to the soup pot. When I cook a pasta sauce with fresh, garden tomatoes, I usually add a little sugar to counter the acidity. Most canned tomato products are already sweetened, so taste the sauce and add a little sugar, only if it needs it. If you're accustomed to the copycat version of Pasta e Fagioli soup that is made with commercial spaghetti sauce, corn syrup is usually the second ingredient on the label, so you'll very likely want to add the sweetness. I use brown sugar here - just 1 to 2 teaspoons is usually enough, but add a little, taste and adjust to your own liking. Bring the mixture to a boil, reduce heat and let that simmer for 15 minutes, stirring occasionally. Drain and rinse the canned beans together, then remove 1/2 cup of the mixed beans and mash them. Stir the mashed beans into the soup pot. Add in 1 quart of vegetable or beef stock or broth. I decided to use a vegetable base here with water. My favorite bases are the Better than Bouillon branded products, but I had some Great Flavors brand vegetable concentrate in the fridge I needed to use up, so that's what I used. Even though we already have veggies in this soup, I like to add a little V-8 tomato juice to many tomato based soups and stews, for the extra bump of veggies and flavor. I drink V-8, so I've usually got a few cans of the original version in the pantry, but the spicy hot flavor is a favorite addition in cooking if you like the heat. Add in the remaining beans here too. If you using greens, add them here. You can use fresh, frozen or canned - thaw the frozen and squeeze out any excess moisture before adding to the soup and for canned, drain them first. You'll also want to chop them before adding them so that they are more manageable bite-sized pieces. Bring the soup back up to a boil, reduce to a simmer, and let that slow cook for 20 minutes. If you're not pre-cooking your pasta, add the raw pasta in the last 10 to 15 minutes of cooking time; cooking until the pasta is tender. Taste the soup and add salt and pepper as needed. I prefer to precook the pasta separately so that it doesn't absorb all of the liquid from the soup. Add a serving of it (about 1/2 cup) to each soup bowl. Ladle the soup on top. Garnish with fresh chopped basil or parsley, if desired, and a light grating of fresh Parmesan cheese. I love this soup with a nice, mixed garden salad and crispy slices of homemade garlic bread. Prepare pasta in boiling, salted water according to package directions; rinse to wash off excess starch and let drain well; set aside, stirring occasionally to release excess moisture. Heat olive oil over medium in a large soup pot and sauté the onion, carrots and celery about 10 minutes, or until tender. Add the garlic, Cajun seasoning, Italian seasoning, basil and sage; cook another minute. Add the ground beef and cook until no longer pink; drain off any excess fat. Use kitchen shears to chop up the tomatoes in the can, or crush them with your hands and add to the soup pot. Bring to a boil, reduce heat and let simmer for 15 minutes, stirring occasionally. Taste sauce and add sugar, only if needed. Drain and rinse the beans together, remove 1/2 cup of the mixed beans, mash and add to the pot, along with the stock/broth, V-8 juice, remaining beans and greens, if using. Bring soup back up to a boil, reduce to a simmer and let cook for 20 minutes. Taste, add salt and pepper as needed. Add a serving of the cooked pasta (about 1/2 cup) to each soup bowl and ladle the soup on top. Garnish with fresh basil or parsley, if desired, and a light grating of fresh Parmesan cheese. Very nice served with a salad and crispy slices of homemade garlic bread. Cook’s Notes: Substitute fresh herbs whenever you have them. You'll want roughly a 3 to 1 ratio. For a non-meat meal, eliminate the ground beef and use a vegetable broth. Substitute 2 cans of cannellini (white kidney) beans and omit the red. Substitute fresh tomatoes when at peak and in season; you'll need about 3 extra large tomatoes. If you substitute jarred or canned pasta sauce for tomatoes, it already contains salt and sugar, as do some canned tomato products. Be sure to taste for seasonings first, before enhancing further. Soup will thicken with refrigeration. Loosen with a little additional broth before reheating. Since we don’t consume a full pot of soup at one sitting, as with all of my pasta soups, I prefer to cook the pasta separately and add it to individual bowls, spooning the soup on top. Otherwise, the pasta absorbs much of liquid in the soup. If you are going to eat all of the soup in one sitting, you can wait to add the uncooked pasta in the last 10 to 15 minutes of simmer time. Allow to cook until pasta is cooked through and tender. To Use Dried Beans: Soak 2 cups of beans in cold water overnight; drain. Add fresh cold water to cover, bring to a boil, reduce heat and simmer for 2 hours, or until tender. Drain and use in recipe. Slow Cooker: Brown meat, drain and add to a 6 quart slow cooker along with all of the remaining ingredients, except for the pasta. Cover and cook for 7 to 8 hours on low or 3 to 4 hours on high. Add the pasta to the crockpot the last hour (for low) or half hour (on high) or until cooked through and tender, or prepare pasta separately, draining and spooning a 1/2 cup serving into individual soup bowls. Top with soup and garnishes, as desired. i have been searching for a good recipe for this, and here it is. thanks so much. Yep! That there soup is a winner! Your soup looks yummy Mary, and I could use a large bowl of it today. We have another cold front moving through so soup is on my menu this week. I heard!! Looks like the groundhog was WRONG I guess. Stay safe & warm Lynda! Try using a good left over ham or ground Italian sausage for a more traditional taste instead of ground chuck. Also, Pasta Ceci is very much like this dish but uses chick peas instead of beans. Throw a Southern Spin on Pasta Ceci by using black eyed peas and again, a good leftover ham. Thanks for the suggestions Mac! Thank you for the recipe. I made a pot last night for supper, made a fresh loaf of bread, invited a few neighbors in and we went at it! It was a huge hit! I made a pot too, sprinkled on some Romano cheese with a side of breadsticks. Good stuff. Publix makes a good Italian sausage with fennel and I will use that next time. Thanks Mary. You're welcome Joe! I bet that sausage will be awesome in this soup. Made for Dinner last night perfect for one of our last cold, rainy AZ Winter nights! Thank you! Your site is one of my favorites! Thanks so much & thanks also for reporting back that you enjoyed the soup - I really appreciate that! This is the first thing that I made for the women at Alexis' work last year and they loved it. It's a great soup isn't it?! 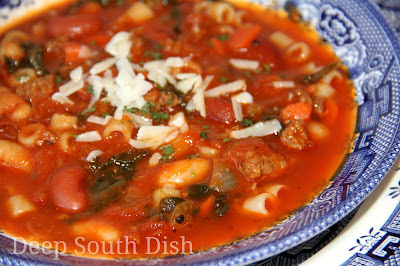 I have been making a soup that I thought was a bit like Pasta e Fagioli for a long time. I always use just a 1/4 to 1/2 lb of ground chuck. I am looking forward to adding the bean paste next time. I can buy fresh tomatoes and celery year round in Honduras for pennies. I often add green beens since they are availabe too. Thanks for sharing a great recipe. Mary, your recipes have made me the most skilled 21 year old that I know. Every recipe I have tried from you has been amazing! This soup was delicious. Thank you for taking time out of your day to run this wonderful site. Thank you SO much Karina - you just made my day!!! Sounds like a great idea Michael! What very interesting variations on an old Italian staple. But then-again, there’s probably as many variations of this as there are ditalinis in the soup. I don’t know why I’ve never tried ‘Slap Ya’ Mama’ in this before. I’d put that stuff on my Wheaties. I guess I just figured that the Italians and the Cajuns would be dukin’ it out in my soup, and the outcome wouldn’t be tasty. I use fresh spinach in mine. I toss it in at the last moment so it’s still ‘tender crisp.’ I also use V8 in my soup. I buy the big bottle so there’s some left over for the chef. Some V8, vodka, a splash of Worcestershire Sauce, or as Justin Wilson would say, “Lee n’ Per’rones”, a dollop of horseradish, a couple of shots of the ol’ ‘Creole Torpedo’ (Frank’s Louisiana Hot Sauce, and yes… a pinch of Slap Ya’ Mama. I top it off with a homemade pickled asparagus spear as a ‘swizzle stick.’ Try it, you’ll like it. As Graham Kerr used to say, “I cook with wine all the time. Occasionally I even add it to the food. BTW, where I come from (NYC), it’s pronounced “Pasta Fazoole.” Hey… youzz gotta accent. I don’ gotta accent. Badda-bing! Your comments always show your great sense of humor Chris. I've noted our "Americanized" version of this is much more involved than the authentic Italian version. Guess most of us know it more along the Olive Garden lines! Your interpretation sounds delicious! I sure miss ole Justin Wilson - he was entertaining!! How y'all are? !